Since kids have always been fascinated by dolphins and our Pacific Bottlenose dolphin family is always ready to play with new friends, we've developed Dolphin Kids. 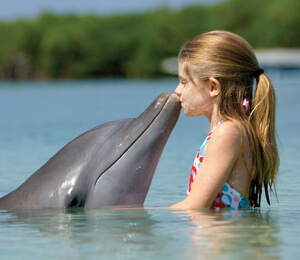 Designed to provide rewarding dolphin interaction to children ages 4 to 9, Dolphin Kids will give your young child a chance to get closer to dolphins than he or she ever imagined. Because Dolphins are highly intelligent and gentle creatures, they are ideally suited to provide children with their first close encounter with a marine mammal. Our "kids only" adventure provides a safe environment where children can interact and play with our friendly dolphins in an environment specifically designed with their needs in mind. This fun, interactive and informative program begins poolside with an introduction to our dolphin family: Toulouse, Merian, Monet, Ende, Frida, Renoir and Dali. Following their introduction, kids will spend time interacting with and petting the dolphins, under the supervision of an experienced trainer, from a shallow shelf in our custom designed pool. Group sizes are limited so each child will have the chance to pet, hug, and kiss the dolphins. The program ends with the dolphins showing off their breathtaking jumps for the children. The Dolphin Kids program is for children ages 4 to 9 only. Parents may observe their children from the poolside free of charge, but will not be allowed to interact with the dolphins. To keep distractions to a minimum for both kids and dolphins, photographic equipment is not allowed. However, a team of specially trained photographers will be on hand to commemorate your child's special moment. Photos, souvenirs, food and beverages are available for purchase at the Dolphin Center. The Dolphin Center has been featured on cable networks, including the Discovery Channel, the Travel Channel, BBC, MTV and CNN among many others, which means that groups fill up quickly and it is critical make reservations well before you visit Cabo San Lucas. Whether your child is fascinated by dolphins or just looking for a unique adventure, the Dolphin Kids program at the Cabo Dolphin Center will provide your child with an exciting and educational experience that he or she will cherish for years to come. I have been to the Bahamas many times, but Cabo Dolphin Kids is one of my favorite trips! It includes everything that everyone should do here. As a Bahamas veteran, I can say only the best about this experience!